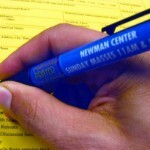 Become a registered student member of the Newman community by filling out the form below (SIU or John A Logan). If you have registered before, you may register again to let us know any new activites you would like to be involved with. IF YOU ARE A PARENT, ALUM, PERMANENT COMMUNITY MEMBER, OR OTHER SUPPORTER OF NEWMAN, PLEASE CLICK HERE FOR OUR NON-STUDENT REGISTRATION FORM.